I was given the wonderful opportunity to photograph the ghost walk around Leek the Friday before last and thought it was time i post one of the shots. The walk is lead by Bill Cawley and covers a wide range of buildings highlighting their links to the supernatural and macabre. Since doing this blog i have learned a lot about the history of Leek, but most of this walk was an eye opener, to the extent that at times i even forgot to take pictures. 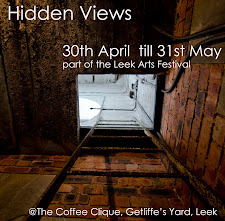 For more information on Shriek in Leek check out the web site. To finish the run of shots from Scooter-fest 2010, my favourite scooter (well one of them). Just to prove we are still in Leek you can see the roof of the Nicholson Institute in the back ground to this great looking orange number. Every where i looked there were photo to capture, this is like loads i took just to capture the detail that goes into these machines, just look at all that chrome! Looking like something straight out of a 60s Italian film, I expected Sofia Loren to stroll over and drive it away, less a means of getting from A to B than a work of art. This really is Leek although for a few short hours it took on the appearance of a holiday resort, here is a shot the for me summed up the day a collection of great Scooters, great surrounding and people just sitting back and enjoying it all, the Scooters are all from Birkenhead Cloud 9 Scooter club (i think). Sunday in Leek never used to be this busy, but this Sunday was SCOOTER-FEST organised by The Jesters Scooter Club and for once the town centre was jumping. The local clubs 6th annual festival for Scooters and all thing related to the scene turned the town centre in to a riot of colour and noise with 100's of Scooters from all over the country turning up to enjoy one of the hottest days of the year and a great example of what Leek can do. Over the next few days i will let you all enjoy a bit of the colour for you selves. On what they are promising to be the hottest day of the year so far a shot taken back when we had snow! Well i think it looks pretty. Rudyard visitors centre as seen from the other side of the lake. A bar behind bars, how sad and the remains of a much loved pub gone to ruin are getting to be a much more common sight. The Nicholson Institute (Leek Library) is now one of only three such buildings in the country still used for it's original bequeathed purpose. The institute provided a library, art gallery, museum and school of art. The library was free to people living within 6 miles of the town. After three years the library was supported by the town as the local authority. The library is now run by Staffordshire County Council. Features of interest on the exterior of the building include a set of tableaux over the windows depicting former activities at the school. Among them are tableaux depicting Science, Physics and Chemistry, Music, Art, Literature, Cookery, Needlework, Dyeing, Manual Instruction, Weaving, Commerce and Agriculture. Many famous figures have entered the Nicholson over the years. Having a museum, library and education rooms, the institute played host to music recitals and lectures by the likes of Oscar Wilde and John Betjamen. Joshua Nicholson, who became head of textiles firm Brough, Nicholson and Hall, paid for the institute to be designed and built. On 11th September 1882, the foundation stone of the Nicholson Institute was laid by Mrs Nicholson and on 16th October 1884 the building opened. Given its position, set back from the Stockwell Street, the Institute is not easy to photograph. From the main road, the building is partially obscured by the 17th century stone-built Greystones house. The Nicholson Institute was built at the expense of Joshua Nicholson, a local manufacturer, in memory of Richard Cobden. It was opened in 1884. It is a brick-built three storey building designed by the Leek firm of architects W. Sugden and Son. A Great old mill, that used to have a factory shop at the front selling its products, now an antique shop. I'm going to take you on a walk up St Edward street in Leek, in reality the walk will only take 5 mins, but here i'll spread it over 8 days, day 8. Stanley's on the corner of Stanley street and St Edward street, i think it used to be a bank, then a bookies, now its a pub. The road leading off ends at the bottom of the market place, just by the white building. This is the end of my walk up St Edward street, with a bit yet to go, i may just cover that end in an other set of shots. I'm going to take you on a walk up St Edward street in Leek, in reality the walk will only take 5 mins, but here i'll spread it over 8 days. day 7. The Leek united building society, now leeks only home grown building society, this is their head office right in the heart of the town. I'm going to take you on a walk up St Edward street in Leek, in reality the walk will only take 5 mins, but here i'll spread it over 8 days, day 6. Next door to yesterdays building and in a totally different style, check out the upstairs windows, to keep the roof level they have missed off the feature above 3 of them. I'm going to take you on a walk up St Edward street in Leek, in reality the walk will only take 5 mins, but here i'll spread it over 8 days, day 5. About a 1/4 of the way up stands this fantastic building, on of my favourite in all of Leek, dated 1883. I'm going to take you on a walk up St Edward street in Leek, in reality the walk will only take 5 mins, but here i'll spread it over 8 days, day 4. Spout hall, St Edward street used to be called Spout street, after the river that used to run down it. Opening day of my new exhibition, Bricks and Water. 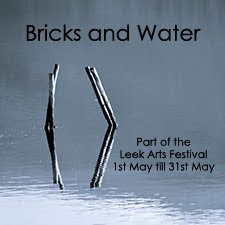 The free exhibition, “Bricks and Water” is inspired by the wonderful mix of water, light and reflections, from the natural world, juxtaposed with a collection of images from the man made world high lighting some of the fantastic buildings we have locally. 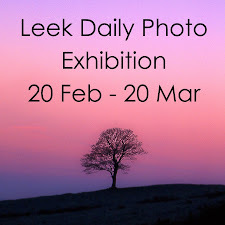 The photos are a mix of Digital images, Prints and Slides, taken over a number of years and are being shown as part of the Leek Arts festival. Wonderfully displayed in the Coffee Clique, Getliffe’s yard from the 1st of May to the 31st of May.